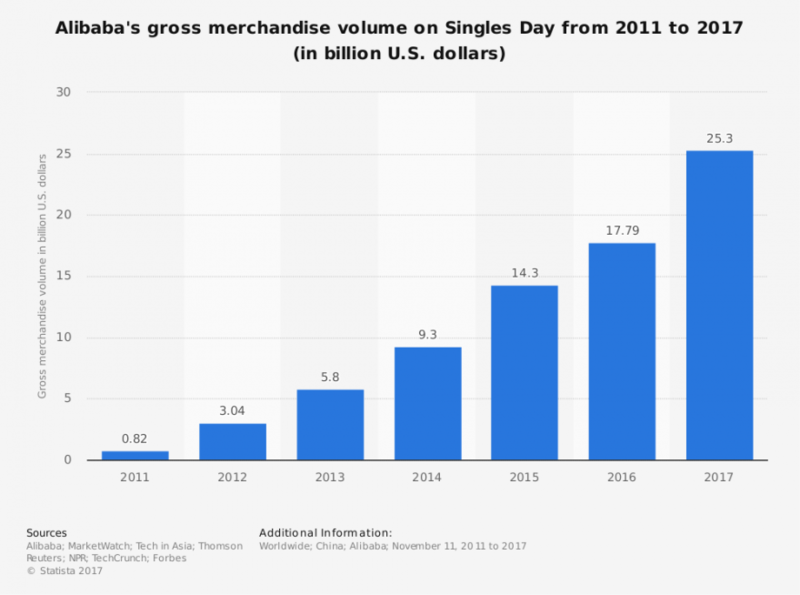 This year, Alibaba’s Singles Day Shopping Festival (also rebranded as double 11 Global Shopping Festival) entered into the ninth year. In 2009, retailer Alibaba turned the day into Chinese version of Black Friday. And eight years later, November 11, is becoming the biggest 24-hour online shopping festival on earth. 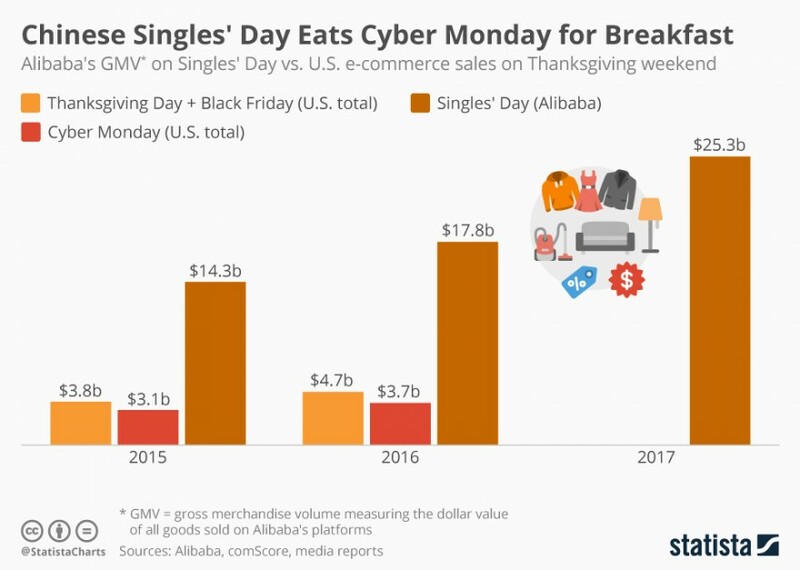 Sales from Alibaba’s one day event has nearly doubled those from Black Friday and Cyber Monday in the US combined. “Retail as entertainment” is one of the hallmarks of Singles Day. Alibaba is creating new sales record each year since 2009. In October last year, Jack Ma put forward the concept of “new retail”, which uses big data to seamlessly integrate online and offline activities. At zero hour on the day of November 11, consumers from China and other countries were all rushing in. Within 24 hours, they splurged on record-breaking $25 billion of purchases, a nice 40% increase from last year. As Alibaba’s CMO Dong Benhong said, not only we create consumer miracles, more importantly, the massive orders, the enormous amount of consumer data is captured. These real numbers provide data support for our next year’s business plan. $25.3 billion sales within 24 hours. 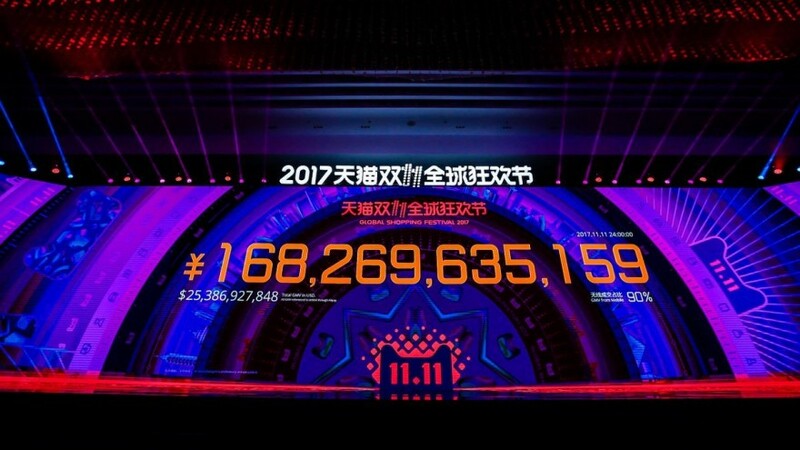 Alibaba smashing its own record from 2016 ($17.8B in year of 2016). The number reached as high as $5 billion in the first 15 minutes. In comparison, the total sales of Black Friday and Cyber Monday combined in the U.S. was only $6.79 billion in 2016. Behind this number, Focusing on providing a personalised experience and intelligent recommendations for consumers may have contributed to their success. Alibaba also said it had turned 100,000 physical shops around China into “smart stores” for this year’s global shopping event. Over 60,000 global brands participated on this year’s “shopping party”. Familiar brand names such as Lululemon, Nike, Gap, Mac, and Macy’s. Products from US, Australia, Germany and South Korea were among most loved by Chinese consumers. In regards to what consumers actually bought on the day, baby milk powder, diapers, multivitamins, and other wellness related products were on the top of many people’s shopping list. As it is well known that health and safety are the top concerns of Chinese consumers. 1.48 billion transactions were processed by Alipay, with 90% were done through mobile phone and tablets. Last year, mobile payments already accounted for 82% of Singles Day’s sales. In comparison, only about 30% of shoppers on Black Friday used mobile payments last year. China’s mobile payment system is more sophisticated and way ahead of many western countries. A great majority of Chinese consumers leapfrogged the era of desktop computers, moving straight to smartphones/tablets. It allows them to embrace Alipay’s convenience when making purchases through their devices. What truly sets the Single Day Shopping Festival is how Alibaba is leveraging its innovative technology combined with the scale of Alibaba’s entire ecosystem. It brings the future of retail in reality for Chinese consumers. With global trade closer than ever before, there has never been a better time to learn from the increasingly innovative retail landscape in China and to embrace the opportunities it presents. The total retail market in China was nearly $5 trillion in 2016. By 2020, China will account for about 60% of global e-commerce. For consumer products companies, winning China means win the world!